What Is the Italian Dining Experience? Before you begin working your way to foreign language fluency, it helps to understand the culture behind the language you’re learning. After all, language exists to help a group of people express their ideas and beliefs. Italy is an old country with a rich history and culture. As you begin your Italian language program, gaining a strong grasp on this history, the values, and the etiquette will help you rapidly achieve success. In particular, dining out in Italy is a complete experience for Italians with very high expectations. In Italy, it is commonplace for restaurants to only book each table once per night. 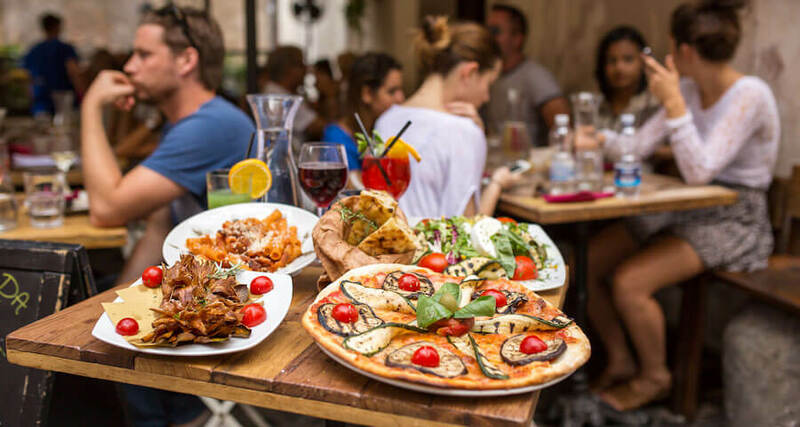 Compared with other cultures where restaurants focus on getting as many customers in and out as possible, Italian restaurants expect guests to stay for the entirety of the evening through all of the courses and many rounds of drinks. As such, you will not be hurried along through your meal which will add to the comfort and low-key atmosphere of your dining experience. When choosing a place to dine, you have a few options. A regular restaurant (“ristorante”) usually offers multiple-course meals at the highest prices. If you’re feeling like something a bit tamer, look for a smaller local restaurant (“trattoria”). These hole-in-the-wall places are usually family owned and operated, offer smaller menus, and stay within a lower price range. Do not shy away from these smaller restaurants; gems are hiding all over Italy’s largest cities with dishes that you will want to write home about. Many people travel to Italy to sample authentic pizza and gelato which are never hard to find in abundance; simply look for “pizzeria” and “gelateria” joints to satisfy your cravings. If you’re searching for a home-cooked meal, find restaurants offering “cucina casalinga.” For quick and easy snacks, a “tavola calda” is your best bet. You may want to avoid restaurants advertising tourist menus (“menù turistico”), which can often be overpriced and of poor quality. If you’re more of a wine enthusiast, you’ll feel at home in a wine shop (“enoteca”) that also serves some food. Whenever you are visiting a foreign country, it is important to understand your bill when completing a meal out, as well as the best practices for tipping. While it never hurts to ask a local, language barriers can sometimes make this impossible. Understanding some simple words and phrases can help to reduce the confusion so you can end your meal with as little frustration as possible. When you have finished your meal, remember to ask for your bill (“conto”) from the server. Restaurants often expect you to stay at your table for many hours, and they will not bring your bill until you indicate that you are ready to pay and leave. Your bill will include a value added tax (“Imposta sul Valore Aggiunta”, or “IVA”) and a cover charge called “coperto.” Italian businesses are required by law to provide you with a receipt (“scontrino”) after services have been completed. If they fail to do so, they can be fined heavily. Tipping is completely up to you and is usually only given for exceptional service. Remember that servers do not receive any of the gratuities included in your bill, so you should include a few extra coins if you wish to leave them a tip.